Made from carefully-selected pineapples with no additional sugar or preservatives, this Del Monte 6 oz. canned pineapple juice is pure, delicious, and a great source of vitamin C! Compared to other types of packaging, this canned juice provides convenient storing and stacking to keep your business in good supply. When ready for use, simply chill, shake well, and pour! Refrigerate after opening to maintain freshness. Each 6 oz. can provides just the right amount for a single serving of pineapple juice and ensures less waste from any unused product. Del Monte canned Pineapple juice in a case of 48 is the best deal out there that I can find. Del Monte has the best tasting pineapple juice and is a staple behind our bar to use as a mixer. Del Monte is one of the best brands out there! It is hard to find canned pineapple that still tastes fresh. This juice tastes very fresh! This del monte canned pineapple juice is one of the best brands of pineapple juice you can get. So fresh and flavorful. And these small cans are great for tossing in your lunch. Or so you dont have to open a huge bottle or can to mix a drink. Great product! We use this as a mixer for a wine-based mixed drink (2 sparkling wine, 1 part seltzer, and 1 part pineapple juice), and it's delicious! Great for many different types of mixed drinks! Price per ounce is lower than in the larger containers surprisingly. Shelf life is outstanding and they are the perfect size for mixing cocktails so there is no waste. 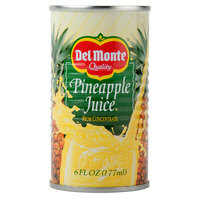 The del Monte canned pineapple juice is amazing and well packaged into individual serving cans. The juice tastes really good and is perfect for cocktails and specialty beverages. Small cans of pineapple juice. Great for use at our bar. We have always bought a different brand, but this is exactly what your looking for. Pineapple juice is one of those drinks that tastes delicious and feels healthy when you drink it. The single serve cans are perfectly precious. The case price is great for this golden nectar! Perfect for the bar, just enough for a 2 cocktails. I have found these to be a far more competitive price then from other vendors. The Del Monte canned pineapple juice is delicious. A great size can and great for breakfast and has a great sweet flavor. A great buy. I love these single serve cans of pineapple juice. They are great for making pineapple chicken and I do not have to waste a big can. A great brand of pineapple juice that never disappoints. The Del Monte six ounce cans are perfect for our bar and the juice is always fresh. A great addition to our juice lineup. I love the high quality of Del Monte products. Their pineapple juice is flavorful and always fresh. The small cans are great for brunch and mixing with orange juice. I love having pineapple juice in my pantry. It's a great addition to sweet rice, glazes, or even homemade punch. Del monte's is always fresh. A great tasting pineapple juice in perfect little single serve cans. The juice is perfect for making our cocktails and especially the Bahama mama. A great tasting juice. Pineapple juice is a must when mixing drinks at your bar. This is very good juice, and we love the small cans they come in so you don't have to worry about storing the leftover juice. This is perfect for making juice cubes. I pour the juice into ice cube trays and freeze. Then I add the cubes to some unsweetened soda water or blend it with a smoothie. Sweetens up a smoothie nicely! In addition we use these cans to restock our juice dispenser. You cannot beat the price and convenience of having the cans delivered. Perfect single sized pineapple juice for either childrens lunch boxes or to serve a child at a restaurant. I love this product it is incredibly great tasting! I am highly satisfied with this 6 oz. Canned Pineapple Juice. So delicious and the size is just perfect. To me, it's just as good as Dole brand yet comes at a much better price. I used to have pineapple juice on our soda gun and it was always going bad. I switched to this product and everyone loves it. We sell a lot more drinks with pineapple juice now and people even drink it without alcohol now. I am very happy with this product. I got these cans for the bar at my wedding and it was easier for the bartender to pour individual cans rather than pouring from a bottle. Great pineapple juice in nice sized cans. Flavor of fresh juice will be great for any cocktail. Price and quality are great too. We would recommend this product. 6 oz. Canned Pineapple Juice - 48/Case these little cans are actually perfect fun or my lunch box and selling them is easier than pouring drinks just gab and shout NEXT! Great price and delicious. I bought it to make drinks at home. Super flavorful and goes well with anything. It is a lot cheaper than the store. This juice is great for anything from a liquor mix to a smoothie mix! The small can size is very convenient and the price is excellent. I love this brand and bought the same brand from my food distributor and now I order it and it is much more cost effective! These little guys are the perfect size for our needs. It's hard to find large quantities of high quality products like this in the grocery stores without paying a premium for the name. We will order these again. This is one Webstaurant product (for our business at least) that is only nominally less expensive than our food house's price. The six ounce size is excellent for inventory control and really cuts down on waste. I buy these to use at home for making mixed drinks or just to drink on its own. I used to buy big cans, but they spoil too quickly. These allow me to open only what I need and eliminate waste. Del Monte has been a trusted brand for the family and this pineapple juice is an excellent staple for drinking on its own or mixed into cocktails! Also great for using in a smoothie with some coconut milk - very refreshing and beachy! This brand is cheaper compare to other brands. I usually go for brand name products but this brand taste as great, you will never know the difference between other brands. I am highly satisfied with my order of this pineapple juice. It tastes just as good as Dole brand yet comes at a much better price. My customers have been just as satisfied as they were when I was using Dole. this is a very nice brend of pineapple juice, it comes in 5.5 oz ounce cans, just the right size . tast great for drinks . great buy. The Canned Pinapple Juice is one of my favorites. You can make bahama moma's mie tie's or just have a nice cold glass of pinapple juice. The kids love it with a dash of cherrie juice they think the are drinking. What a great price to. Nice little canned juices. Better than opening a large 48oz and having to worry about spoilage. Price was better even with shipping than local options. This is a really great product. It tastes very fresh. Great for mai tais or other polynesian drinks at the bar. The can is a great size too. This is a great brand of pineapple juice! These small 5.5 ounce cans are perfect for mixed drinks and even for dessert applications! Very cheap price! !